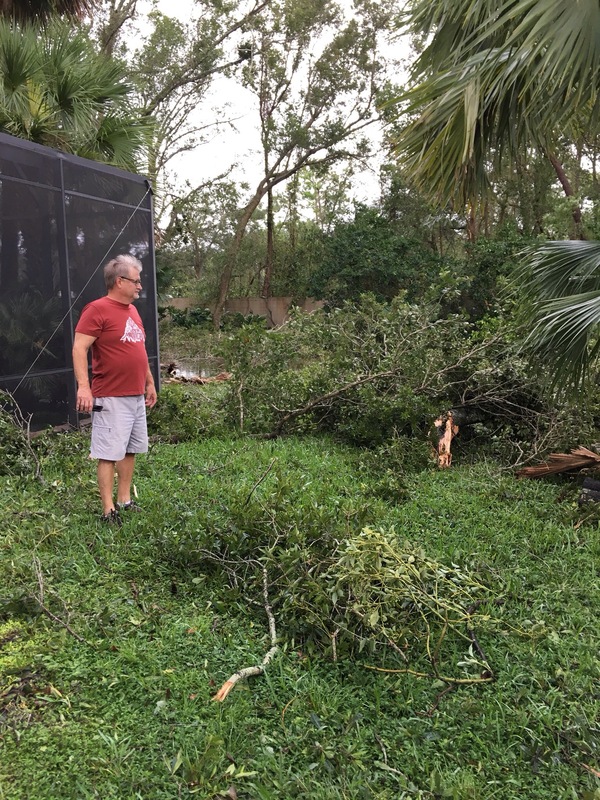 Irma was an unwelcome guest, but there was no stopping her from blowing through. I thought I would share what it was like for me and my family as she came knocking on our door. Looking back, we got off easy compared to a lot of folks, but my story is the only one I can tell. I tell it mixed with prayers for those who have truly suffered through this storm and the many other “natural disasters” that are going on in the world today. By 11:00 Sunday morning we were hunkered, which is a word we used liberally during the entire ordeal. The first rain bands arrived before 3 PM. The wind significantly picked up by 7 PM. By 8:30, those winds became downright scary as they gusted over and around our house. By 10 PM the rain was coming down in torrents. We experienced minor flooding over our front sidewalk. And the eye of the storm was hours away. FYI, we did not board up our house. Our front sidewalk in the light of day. It took 3 days to dry out. We decided to go to bed and get some rest. The worst was supposed to come around 2 AM. My parents seemed to go right to sleep on the other side of the house. Bob and I lay in our bed listening to the weird noises that the wind was making. I thought our roof was going to come off. I told Bob that I couldn’t sleep with all that noise. He said that he could. And he did! I went to the center of the house and tried to rest in a recliner, but by then it was raining even harder and I could hear the dripping in the chimney while the weird noises continued. The wind whipped through our screened pool enclosure making eerie howling sounds. This was the first time in a long time that I can remember being legitimately scared. So, I ate some chocolate chip cookies. The entire household was sleeping through this (minus me, of course). That amazed me, but I was thankful somebody was getting some rest! 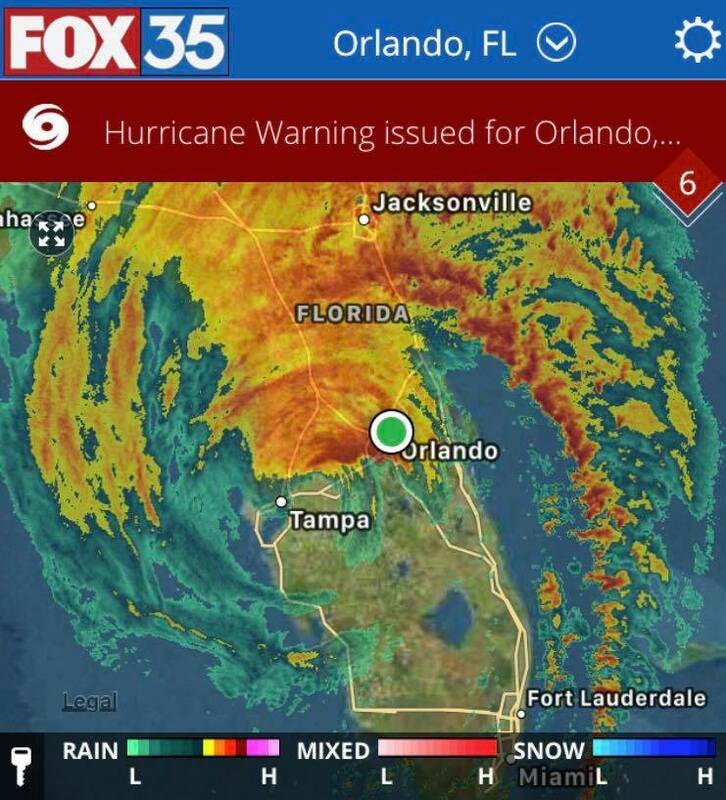 It was now clear that the storm was going to go right over Orlando. With the wind picking up even more, a little before 2 AM, I prepared the hall with cushions and chairs for my parents. Our phones, computers and car keys were placed in Ziploc bags. I was ready to take the hunkering to a new level. I was awake and praying or chatting with other hunkerers on Facebook through most of the night – manning the conn from our recliner in the center of the house while eating the occasional chocolate chip cookie or three. I’d peek outside toward the east and look at the weird lightning and watch the trees bend in the glow of it. The water in the pool, though Bob had drained several inches from it twice, was over the edge. Irma was loud and violent, and the rest of my family slept through it. With everything in place, I returned to my recliner. I must have dozed off, because I woke up around 6 AM and realized that it was over, and we still had electricity. We live in the back of our neighborhood, which has 450 homes in it. A tributary of the Little Wekiva River flows through the center. Typically, it is a creek of about 8 feet width. Monday morning it was a raging little river. 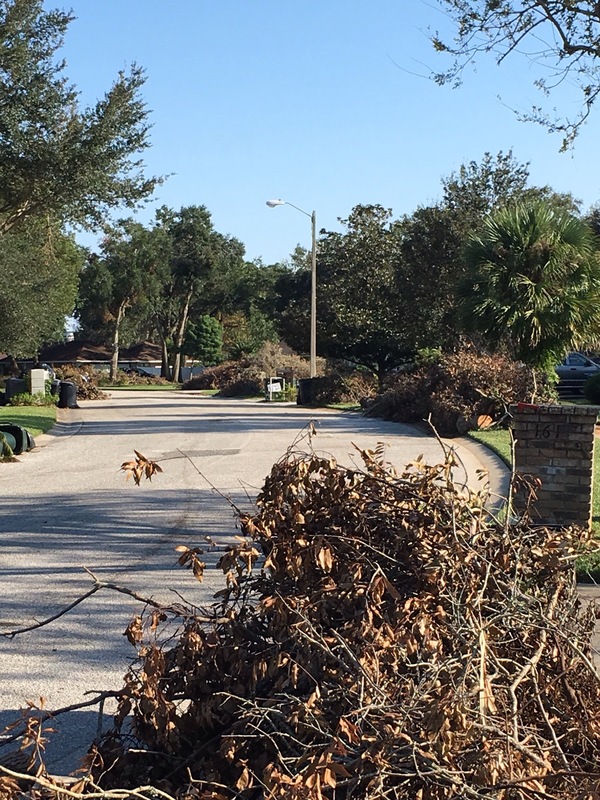 The front of our neighborhood looked like a war zone of fallen trees and debris. They were without power. Our end of the neighborhood never lost it. 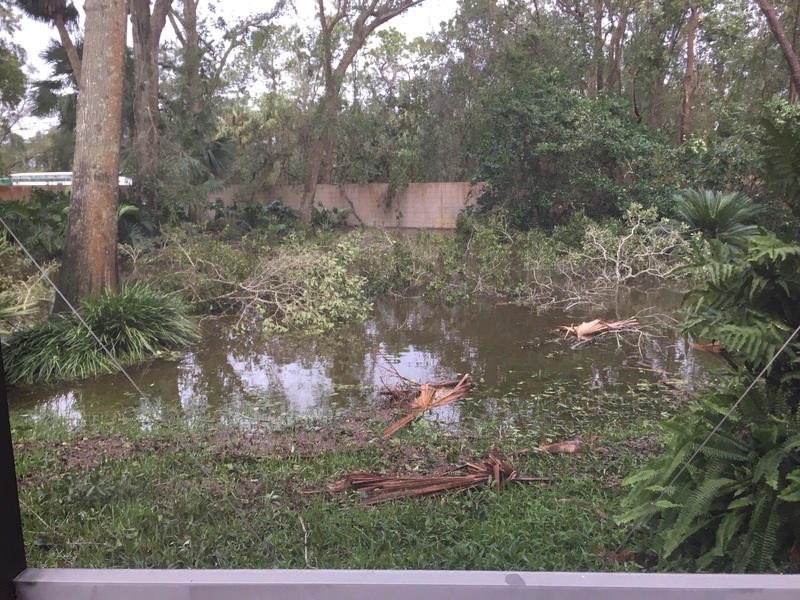 But there were a lot of downed trees and fences and a new lake in our neighbor’s backyard. A wonderful neighbor had a front-end loader and went up and down every street clearing a path. Everyone was outside working and checking on each other. Our damage was so minimal it doesn’t even count. I told my mother that we had an extra blessing from God because they moved in with us. Bob and I put on our sneakers and leather gloves and got to work. Trees are no respecters of property lines. We have the neighborhood border wall behind our house. There is a vacant, treed lot behind us, so we got lots of debris from that. When I set foot in the yard, I was surprised to be up to my ankles in water. But there was no damage and nobody was hurt. We were amazed and grateful to God for that. One of our sons and family showed up in the early afternoon. They were safe but without power. By nightfall, theirs was restored. Our other son and his wife were not so lucky. Theirs was out for nine days. 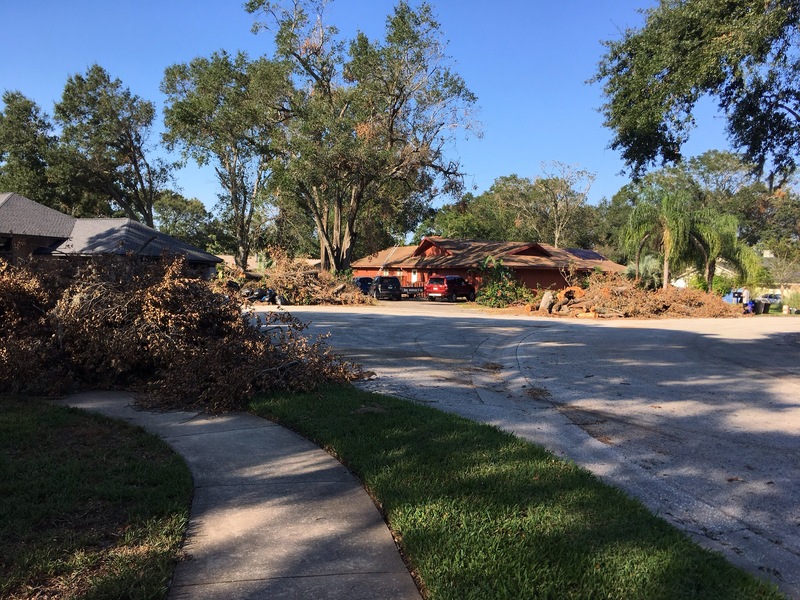 My parents’ home sustained no damage, but that area was without electricity for five days. It may be September, but it’s still close to 90 degrees every day down here. There are piles of debris along the roads that are taller than I am. And there is a subtle, funky smell in the air that is like a mixture of old diaper and chicken farm. Thankfully, the garbage truck removed the regular garbage today, so that may improve. Mass spraying has begun to combat mosquitoes. The sound of frogs in the morning is deafening as they take up residence in the newly formed ponds. We are keeping our eyes open for snakes. Alligators have been reported in some yards and pools. 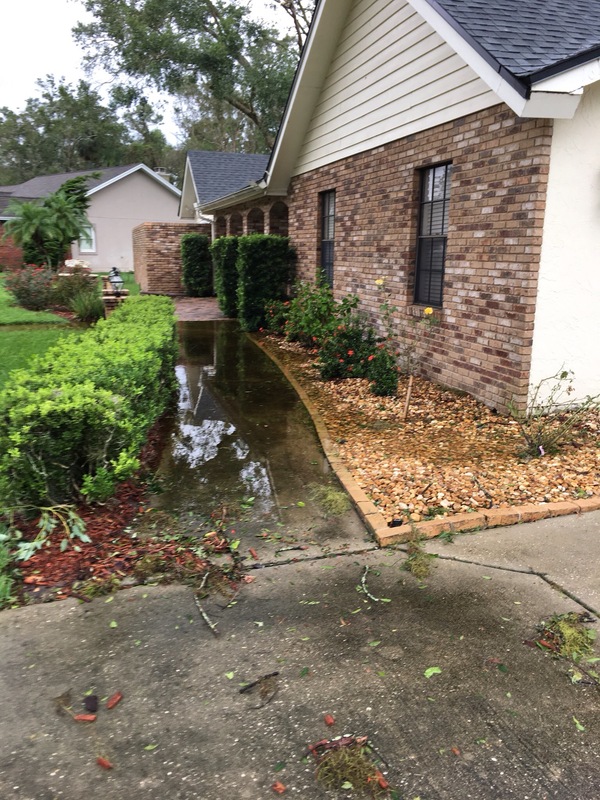 Flood waters are cresting along the St. Johns River. There are still some who have no power and others who can no longer stay in their homes. But we give thanks for being on the other side of this. It has been a blessing watching neighbor helping neighbor and churches joining together to serve. A lot of the differences that tend to divide us have taken their proper place, and we see each other simply as people going through something together. I thought about being afraid in the middle of that night. I thought about how rare that is for me, and I was thankful. Now I think about people living in fear of storms real and imagined and how that affects their lives, and I pray that they will call out to God because He is there.